After losing a loved one, battling over the assets of the deceased is often stressful and draining—both mentally and emotionally. You would think that getting the inheritance that is rightfully yours would be a straightforward process. If you are named as the beneficiary in a will or a trust, or if you are the lawful heir to an estate under California law, it would seem obvious that you should be given what is yours without a fight. Unfortunately, getting your inheritance is not always so simple. Our free trust litigation guide provides an overview of what to expect during the trust or estate litigation process, as well as the actions that you can take in order to finally receive the property that you are entitled to. What circumstances could potentially cause an inheritance to be withheld? 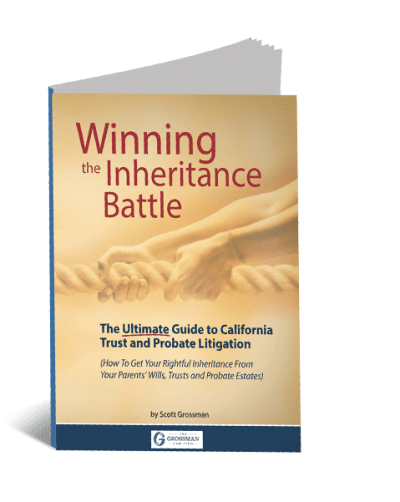 What should I do if the trustee or personal representative of an estate in California is refusing to distribute my inheritance? Carefully read this free trust litigation guide for an overview of the trust and probate litigation process. Contact an experienced estate litigation attorney at the Grossman Law Firm for guidance and protection of your legal rights. Obtain copies of the will, trust, death certificate, and any other estate documents. Keep accurate records of all communications surrounding the matter of your inheritance. Read this article for more information on getting a distribution and find out if we can help you! What if another beneficiary or heir is arguing that I’m not entitled to an inheritance? Sometimes these disputes will arise over a poorly drafted will or trust. Other times, someone may argue that the property you were set to inherit did not actually belong to the decedent. There are many claims that another beneficiary or heir could attempt to make in order to try to block your inheritance. Fortunately, a knowledgeable trust litigation attorney can help you overcome these hurdles and receive the inheritance that you are entitled to. Our free guide, created by attorney Scott Grossman, provides an overview of what you might expect during this process. Winning the Inheritance Battle Book – Get Your Copy Today! Fill out the form below to get your free copy! If you have questions or need help immediately call or chat to us and we will get back to you as soon as possible. Don’t wait there are statutes of limitations! Consulting with an experienced California probate litigation lawyer is crucial to your success. Attempting to battle with a trustee, the person settling your loved one’s estate, or another beneficiary or heir without the guidance of an experienced professional could come back to bite you. Each action that you take could potentially be used against you if it harms your claim to the inheritance. In addition, you are subject to time limitations for bringing actions relating to your right to receive an inheritance. Waiting too long could potentially mean that you no longer have a right to pursue a claim. To avoid these problems and understand more about the process of battling for your inheritance, view our free trust litigation guide today. Don’t hesitate to contact our firm with any other questions.